The sexagenary cycle of Japanese this year is a rabbit. It's not a rabbit of course. 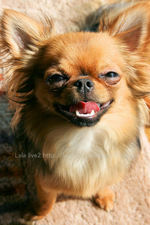 It's my chihuahua. ↑She wears traditional Japanese cloths. This style of kimonos is usually for men. Anyway I wish you a happy New Year. Copyright (C) 2007-2015 Lala live2 All Rights Reserved.